Iceland were eliminated from Euro 2016 in the quarterfinals by host nation France, ending a spectacular run that has made them the darlings of the footballing world. The team itself was a special one, but their fans — the 8% of the Icelandic population that traveled to France to support their nation in its first ever major tournament — also played a big part in building the mystique of Icelandic football. So here’s a tribute to a few in particular. Flag Beard Viking — Iceland’s Norse heritage was a dominant theme with this team and their fans really ran with it. Committing to the viking look is one thing, but to dye one’s viking beard to look like Iceland’s flag takes it to another level. Angry Earmuff Kid — This child’s roar is so powerful that he has to protect his own ears from himself. The Beret Sisters — While these women technically aren’t Iceland fans judging by the German colors painted on their cheeks, the fact that they attended the France-Iceland match dressed up in stereotypical French garb (complete with baguette accessory) leads me to believe they were making fun of the French more than supporting them. So, even though they aren’t going anywhere as Germany will play France in the semifinals, they deserve recognition. The Lost Dutchmen — The Netherlands failed to qualify for Euro 2016, leaving their fans in an unusual predicament for them: having to support another team in a major tournament. These two stuck Icelandic flags in their orange hats and made the most of it. Gummi Ben — Last, but certainly not least, is the Icelandic commentator who won our hearts. We’re going to miss you most of all, Gummi Ben. 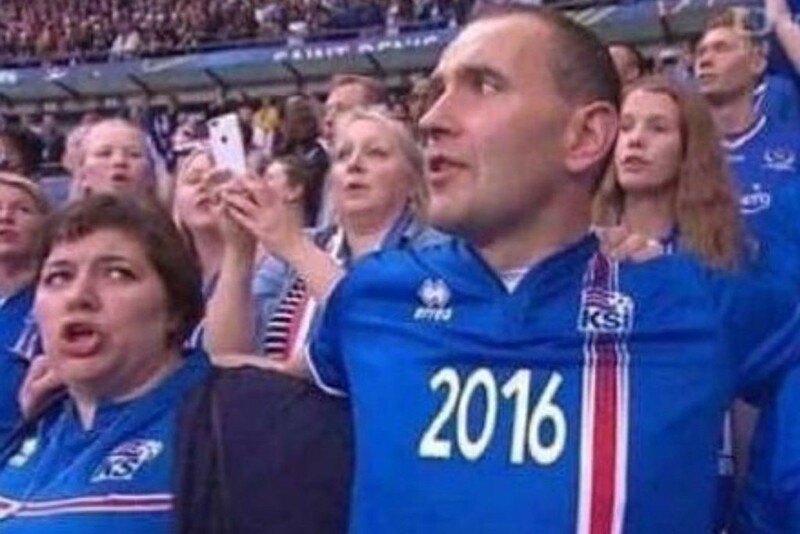 Here’s to Iceland qualifying for the 2018 World Cup so we can hear more of your giddy squeals. A viking slow clap to you all.